MAGS - JUNE 2003 Entry This is a parody of Cast Away. 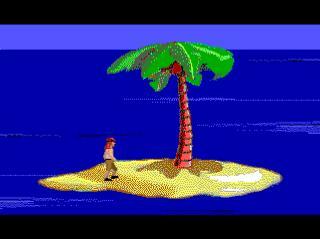 You are Tom Hanks and you have been stranded on a desert island. Can you help the greatest actor ever find his way to safety? This game certainly had its moments, but overall could have done with having more time spent on it (thought obviously as a MAGS game that's a bit of a redundant observation!). Great for a laugh! I always knew that volleyball was evil.